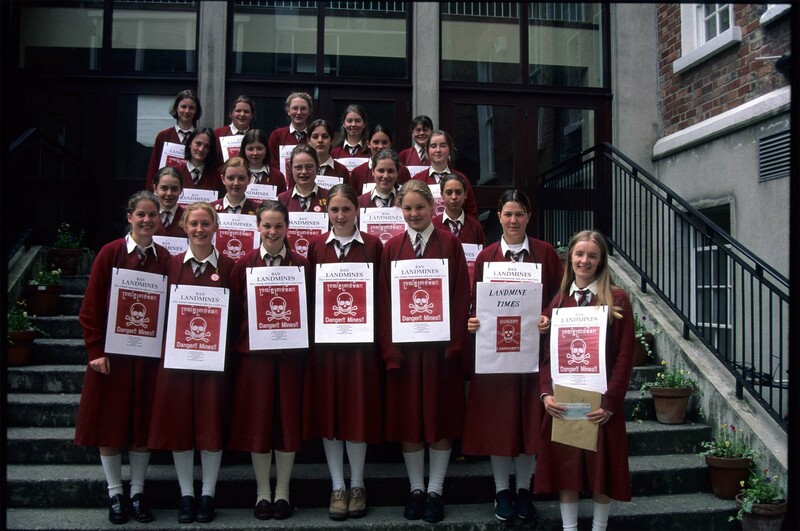 "Students at Loreto School, Dublin"
Peace is the only hope for our world. This becomes more and more evident knowing that today we have the capacity to destroy all life on this earth not only once but many times over, in less than an hour. Our future can only be secured by creating a just society living in peace. More and more weapons do not bring greater security but rather threaten what we want to secure in the first place. The global annual expenditure on armaments is around US $1 trillion i.e. $US 1,000 billion. National and international security will be strengthen not by more and more weapons but when the peoples of the world and their governments come together to forge out fair and just international agreements to live in peace and harmony respecting all peoples of the world. Peace will not come by itself but by our active involvement to make our world a just and peaceful place. In times of armed conflicts, the protection of the innocent civilians has always been a value for all communities and nations all over the world. The international humanitarian law based on the Geneva conventions and their protocols address these values. But it is a fact that in today�s conflicts around 90% victims are civilians. What makes anti-personnel mines so abhorrent is the indiscriminate destruction they cause. Mines cannot be aimed. They lie dormant until a person or animal triggers their detonating mechanism. Anti-personnel landmines cannot distinguish between the footfall of a soldier and that of a child. One of the reasons among many is the use of indiscriminate weapons. Landmines are indiscriminate by their very nature. Landmines cannot distinguish between the foot-step of a soldier and a child. And that was the major legal thrust of the campaign considering the deaths of thousands and thousands in all regions of the world. The call of the International Campaign to Ban Landmines reverberated around the world. Young and old from all sections of society demanded a ban on landmines � no production � no stockpiling, no transfer � no use. And they were banned in 1997. The ultimate objective of the campaign is to secure a mine free world. And the effort continues. A lot has been achieved but a lot more work is needed to be done to make our world mine free. There are millions of mine and unexploded ordnances scattered in about 90 countries. Get involved to make our world mine free. We can do it together. How can I make our world mine free? Learn more about this issue and circulate information to your friends and family. Print this leaflet and poster. Organise a meeting in your community, parish, school or college on the subject. Write an article for your school or college newsletter and magazine. Phone your local radio station and discuss the subject. Support of the work of the organisations engaged in raising awareness on this issue and those involved in mine action programmes i.e. humanitarian demining, mine risk education and rehabilitation of victims. The Irish government played an important role to secure the Mine Ban Treaty. Acknowledge the role of the government and request them to continue the support for mine action programmes. Let us know if you have taken any action by email or letter.